“If, between 1 and 3 pm, you happen to be walking along Madison Avenue where it’s cut by 55th street, don’t be lazy, lift your face up and look at the dirty windows of the black Winslow Hotel. There, on the middle balcony of the last 16th floor is half naked me. Usually, I am sitting there, roasting under the sun which I love, and eating schchi. Schchi with sauerkraut is my usual diet, I’m consuming it pot after pot, day in and day out, I really don’t eat anything besides schchi. The spoon I use to eat schchi is wooden and brought straight from Russia. It is covered with golden, scarlet, and black flowers. 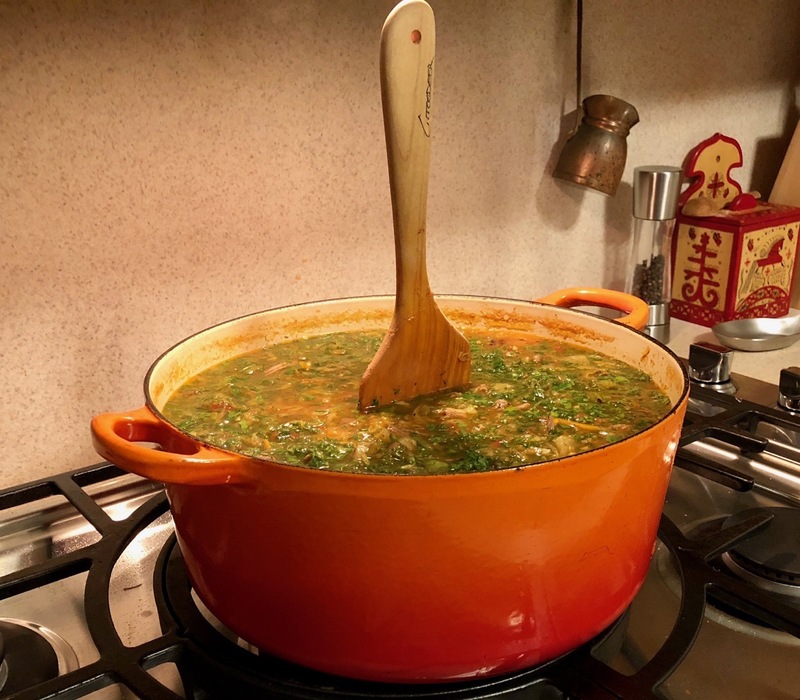 Schchi is a traditional Russian cabbage soup favored by Ivan the Terrible, Peter the Great, Nicholas II, Lenin, Stalin, Grigory Rasputin, my parents, me — you name it. My mom used to make a large pot of it on a weekend to last through the rest of the week for our lunches. 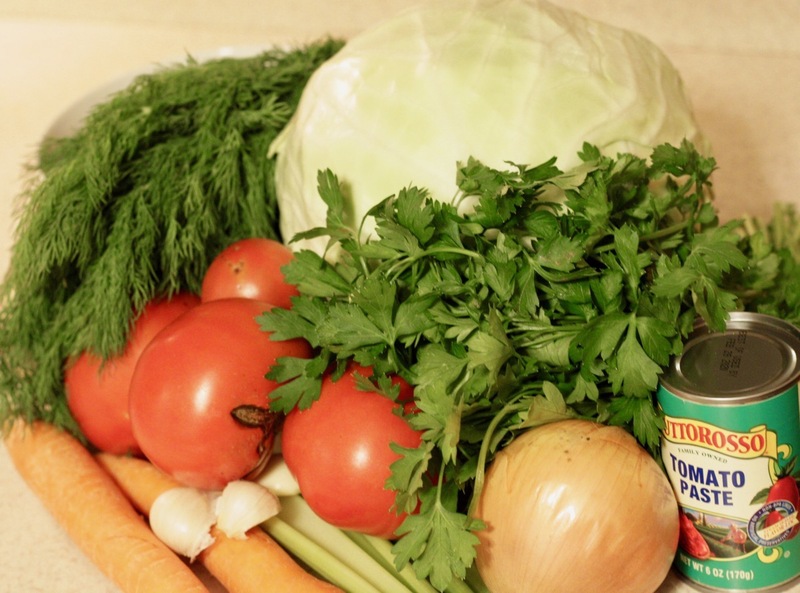 I don’t know why borscht is considered traditional Russian soup. Borscht is Ukrainian. Schchi is Russian. 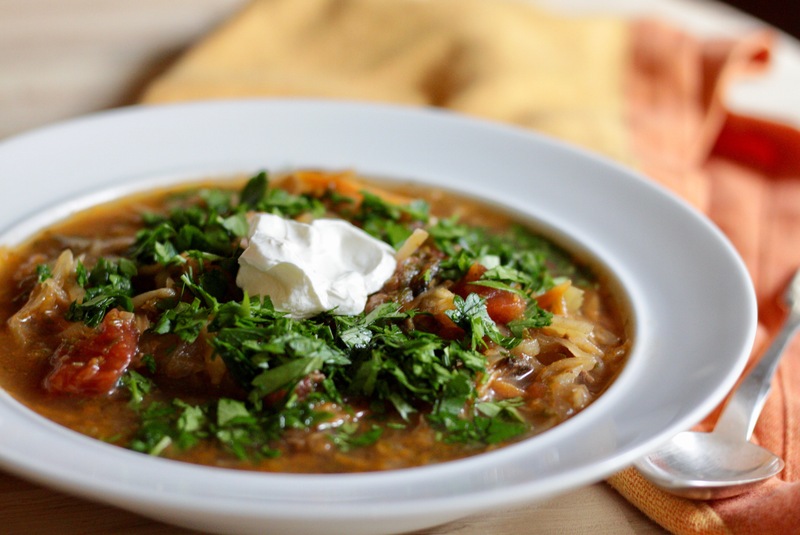 The roots of this soup go back to the ninth century when Russians got their hands on cabbage for the first time. For the frugal ones, the best part of schchi is that neither heat nor cold can ruin it. For the highfalutin — to impress, you can pump it up in so many ways. By the 17th century, Russians learned to freeze schchi in big ice rounds when going on a journey. Chip a piece off, heat it up, and you’ve got a meal. And just like Edichka said, summer heat cannot ruin it either. Schchi only gets better with time. Every Russian family has its own schchi recipe. This one is derived from the scarcity of my mother’s life and expanded by my life of abundance. Brisket and bones are the foundation. Basic vegetables and bouquet garni: I do not bother peeling anything — just scrub it, rinse, cut it in chunks. Done. Don’t go crazy with measurements — choose the largest pot you have, put all what you’ve got in it, and cover with water to the brim. Don’t worry about overflow. 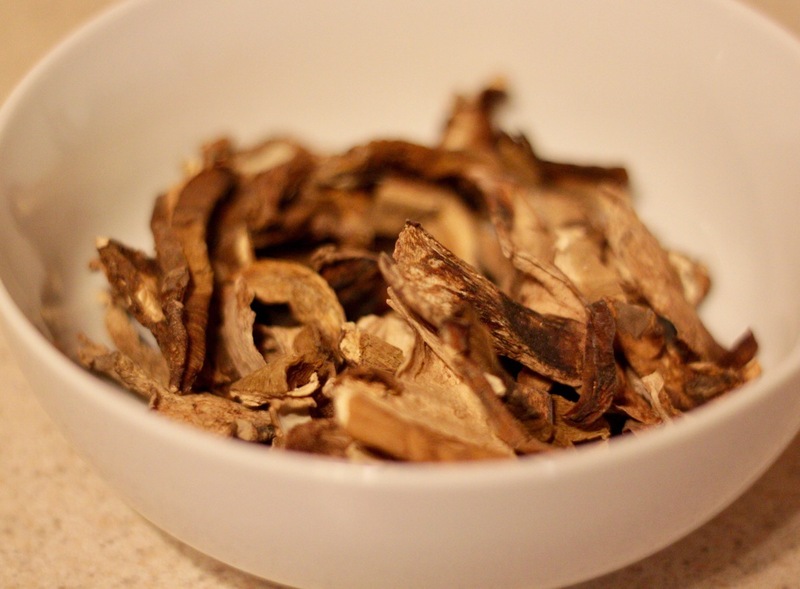 Some of the liquid will evaporate and bones, fat, and aromatics will be later discarded leaving the room for more. 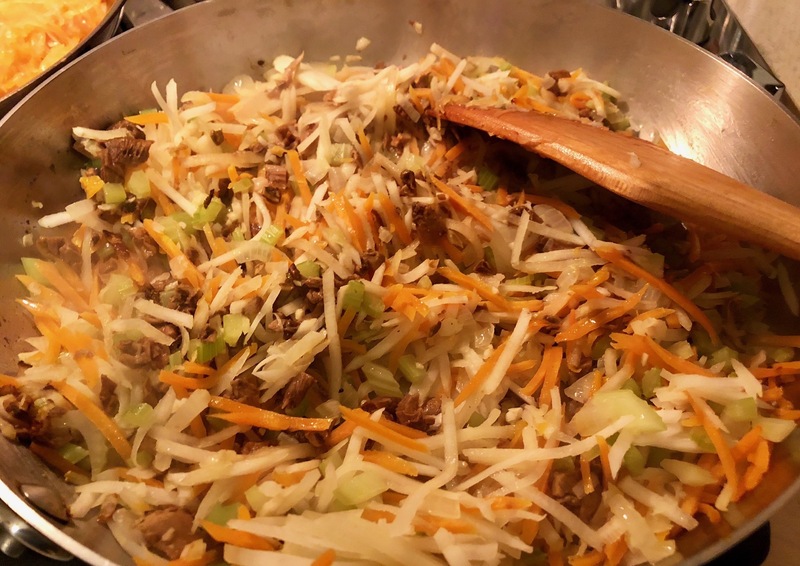 As the broth is simmering, prep your vegetables for schchi: shred cabbage, chop onions and celery, julienne carrots and parsnip, peel and seed tomatoes. Mushrooms, of course. Soak them but don’t throw out the water as some suggest — add it to the broth once the broth is ready. Give some time for the cabbage and sauerkraut to soften. Do not go by time — go by texture — it should feel soft, like you would want it in your soup. When cooking vegetables, go by color. You should see some browning to know that you’re getting your umami. Don’t panic when they stick to the pan — vary the heat to get them unstuck and stuck again. You want some char. Once you feel the meat is fork tender, take it out and let it cool. You should be able to handle it with bare hands so you don’t lose to utensils all the morsels of flavor. Shake out the marrow and save. Throw out aromatics, bones and fat — they’ve done their job. Shred the meat. In my parents’ family, this duty was delegated to my dad as a prize for being a good boy — he got to clean up and sop up some of the goodness along the way. 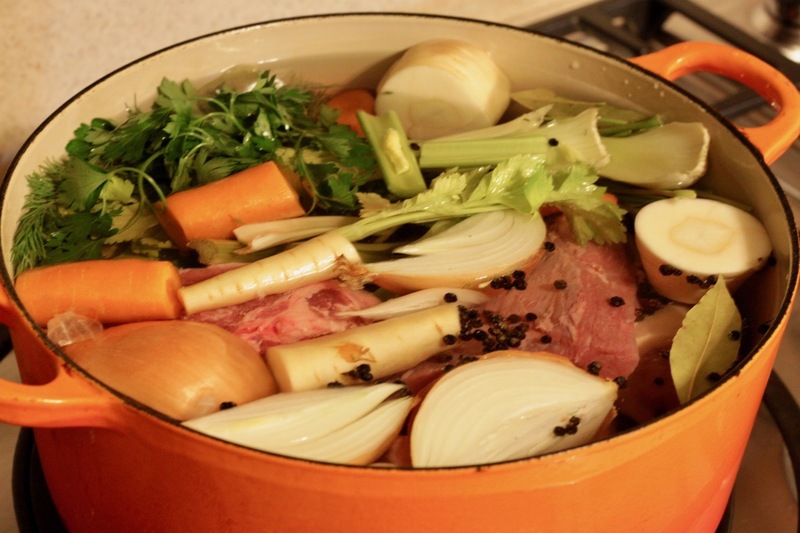 Finally, in a clean pot, there’s clean broth, and the vegetables, and the meat, and fresh herbs. And garlic! In Russia we say: in good schchi, a spoon should stand. Here it is — standing! 1. In a large stockpot, combine all the ingredients for the broth, cover them with water, bring to a boil, and simmer for about 2-3 hours, until the brisket is falling apart fork tender. There’s no need to bother much with skimming the foam — the broth will be strained once it’s ready. 2. 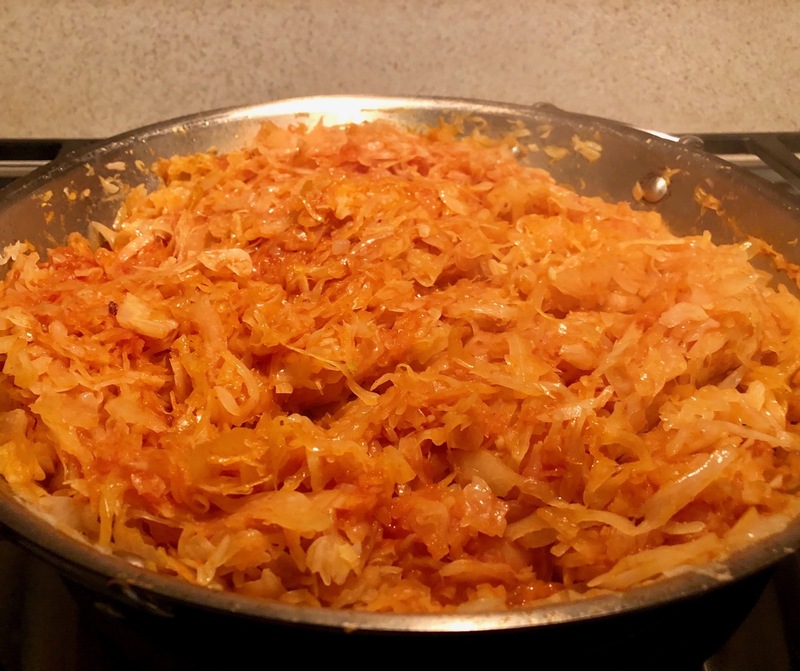 As the broth is simmering away, melt 1/2 stick of the butter in a large sauce pan, add cabbage, sauerkraut, tomato paste, and a cup of stock that has been simmering for at least 30 min or more, cover and let stew over a very low flame for about 45 min, mixing once in a while. 3. While the stock is simmering and the cabbage is stewing, melt the rest of the butter in a large skillet. Add carrots, onion, celery, turnip, mushrooms and sauté until the vegetables start to brown. It could take 15-25 min. 4. 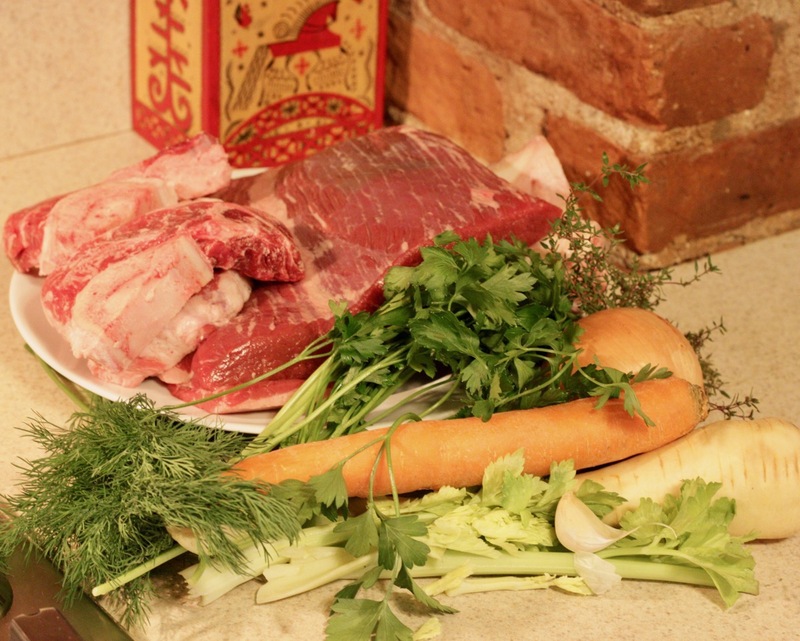 Once the broth is ready, take out the meat and bones and let them cool on a large plate. When they are cool enough to handle, shake the bone marrow out, separate meat from the ribs, and shred the brisket. 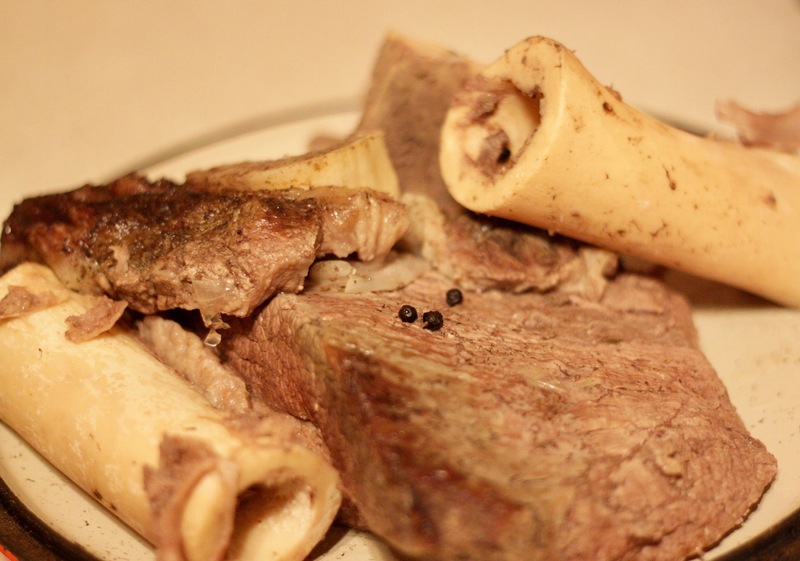 Discard bones and fat. Strain the broth through a cheese cloth and defat it, if preferred. Julia Child once gave good advice to use paper towels to blot the fat off. It works great. 5. To the now clean broth, add the sautéed cabbages and vegetables, tomatoes, salt and pepper and simmer this for about 30 minutes. 6. Add shredded meat, bone marrow, minced garlic and herbs to the pot. Remove from heat. You can eat schchi with a dollop of sour cream and sprinkling of fresh herbs right away, but the soup tastes much better the next day. It tastes even better on the second day, and the third.